Sergei Mikhailovich Makarov (born June 19, 1958 in Chelyabinsk) is a Russian former ice hockey right wing and two-time Olympic gold medalist. He was voted one of six players to the International Ice Hockey Federation's (IIHF) Centennial All-Star Team in a poll conducted by a group of 56 experts from 16 countries. 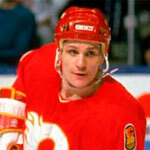 Sergei Makarov was trained entirely in the Soviet Union. He won two World Junior Championships, and was named the best player during his second victory in 1978. Makarov was also on the gold-winning Soviet national ice hockey team in the World Championships in 1978, 1979, 1981, 1982, 1983, 1986, 1989 and 1990 and in the Canada Cup in 1981. 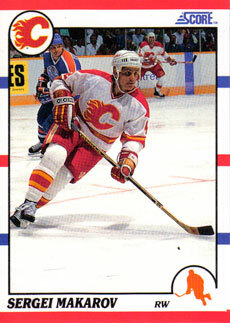 In 1989, Makarov was allowed by the Soviet Union to join the National Hockey League and the Calgary Flames. He won the Calder Memorial Trophy as rookie of the year at the age of 31 (as a result, the rules were changed and now only players under 26 qualify for the award – the Makarov Rule). Makarov also played for the San Jose Sharks from 1993 to 1995. For the 1995–96 season Makarov was dropped from the Sharks’ roster and did not play and became an assistant coach for the Russian national team during the World Cup. In 2001 Sergei was inducted into the IIHF Hall of Fame during the Ice Hockey World Championship in Germany.